Hi every one this will be my first time hosting a Swap please forgive if I am bad or if you do not understand, If you need help just message me and I will help you understand this Swap but it is a easy Swap to understand for sure. 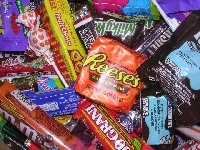 This is a Halloween Candy Swap where you will give a nice small Packages to your 1 (ONE) Partner full of Candy all kinds of Candy any kind of Candy's. But please make sure you check your Partners page to see what Candy\Sweets your Partners are into make sure you try and give them something they like\love, Well the best you can that is. But to help make sure you get what you want\like\love please put some Candy\Sweet names down in the comment box to help people pick out some candy\sweets for you. P.S. any one can enter even if your page is not all the way filed out and if your new to swap bot you can join this swap. THERE IS NO PRICE LIMIT. If any one does not get something from there partner or something happen to there partner please come talk with me about it thanks, I will not be happy if people Fake out on there Partner if you can't do the swap then please don't join it. P.S. If something did happen I will be happy to send some candy\chocolate from Edmonton Canada to help make up for any ones Partner not sending it to them. I love\like all kinds of Candy and Chocolate but here some types. I am not picky either; send me anything you want! i dont care for coconut...how big of a package or does it matter? the size of the package does not matter it is up to you on what size you want to use and how much candy you want to send. I dont honestly like cocunut but anything else is fine!! I love all kinds of candy but hearts for Sugar Free candy. My grandma is diabetic and it runs in the family, though I haven't been diagnosed with it, it's still nice to get candy we can all eat together. I'm not picky when it comes to candy but candy from your neck of the woods would be cool. Oh but no pecans, it's only because I'm allergic to them. I'm not picky too, but i don't like dark chocolate :D Everything is fine, especially something with caramel or jellies! no coconut chocolate no mint chocolate or dark chocolate please. this should be fun!!! My favorite kind of candies are sour or covered in sugar, especially sour belts if you know what those are :) I also love caramel, fruity candies, coconut, or milk chocolate. Is there a price limit on how much we spend? $5, $10? Before postage of course. i agree with some other question is there a price limit and when will partners be made. I am not very picky and I love almost all candies, especially salty ones :) I also love chocolate. I am not much into gummy bears or anything gummy.. And not much into fruity candies. There is no price limit at all. If any one does not get something or something happen to there partner please come talk with me about it thanks.